about the background of the image. 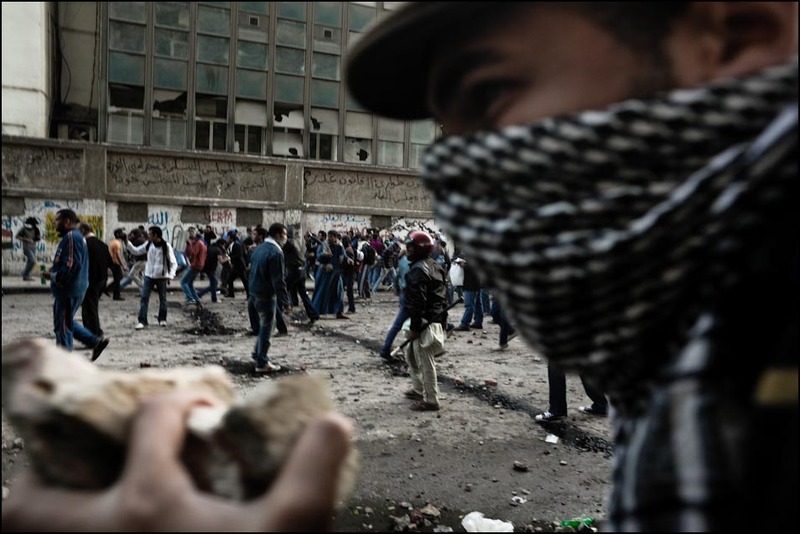 I flew to Cairo to begin a self-assigned project on the stalled Egyptian revolution. Three days after I arrived, thousands of Egyptians took to Tahrir Square once again, the day after authorities tried to clear the square after Friday prayers. This time they called for the end of military rule. 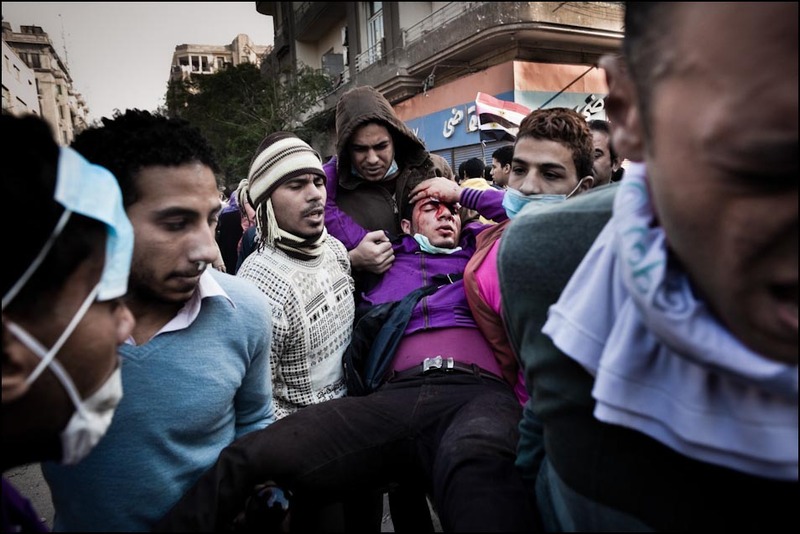 The spasm of violence between protesters and security forces left nearly 2,000 wounded and dozens dead. 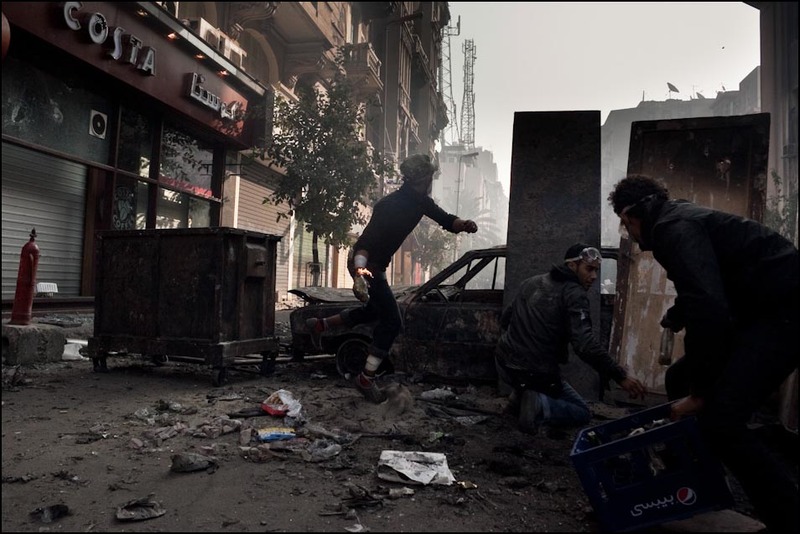 This particular photograph was made on November 22 on the third day of clashes. Before we get to the main image, can you walk us through your days covering this? Days usually began with the same routine. I would usually be up around sunrise, sometimes before. After I would be dressed and ready, I'd do a quick check of my cameras, read my email, then head out the door. The light is better when it's early. I'd hang around for an hour or so. But usually it was quiet, so I'd have the luxury to go find a place to have a coffee and some breakfast. I would never stray too far, because things can change for the worse in an instant, and I wanted to stay on top of the story. I took notice whenever I saw large groups of young men walking toward the square or down some of the side streets. It's a warning sign that something is about to happen, long before the first shots are fired or tear gas is deployed. When you finally arrived, what was going through your mind? When I first arrived to shoot my "stalled revolution" project, I spent those initial days before the violence just looking for quieter images that told the story of the frustration of a failed revolution, and the public's realization that this was a coup d'etat by the military. Of course my plan changed once violence erupted on the streets. safety and how did you map out how you were going to cover the event? There's a few things everyone should think about, whether you're a journalist or a tourist, when you find yourself in a place where bad things are happening. First know your way around on your own, without relying on taxi drivers. Personally I like to walk around. It takes a few days, but it helps me form a mental map of the city. On the day I arrive, I buy a cell phone sim card with a local number. I like to choose a hotel that is close enough to the center of the action, but not too close that you risk getting hemmed in. 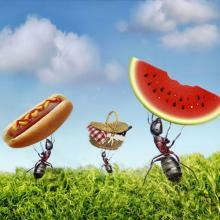 It's important to have a good-sized network of people in the city. Maybe that's only 2 persons, but it's better than no one. Their cell phone numbers must saved on your phone, for sharing information, safety, a variety of reasons. Your level of confidence increases as your understanding of your surroundings improve. leading up to the main image, and the actual moment we're featuring. That morning, I set off with the specific goal of getting very close to the stone throwers. 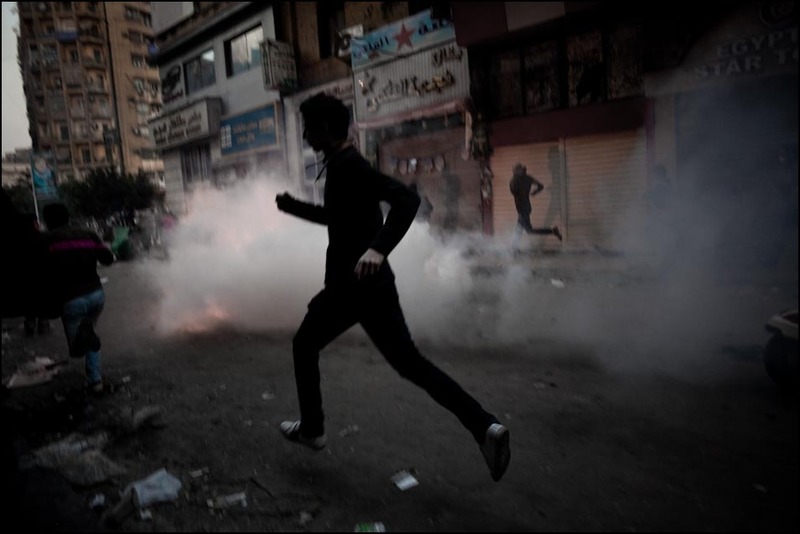 I had been holding back for the first few days, because the tear gas was really strong and I couldn't work. Finally I found a place that sold gas masks, the kind with the replaceable filter. It was hard to frame the scene through my camera's viewfinder while wearing the mask, but it allowed me to work in the middle of the clouds of gas. 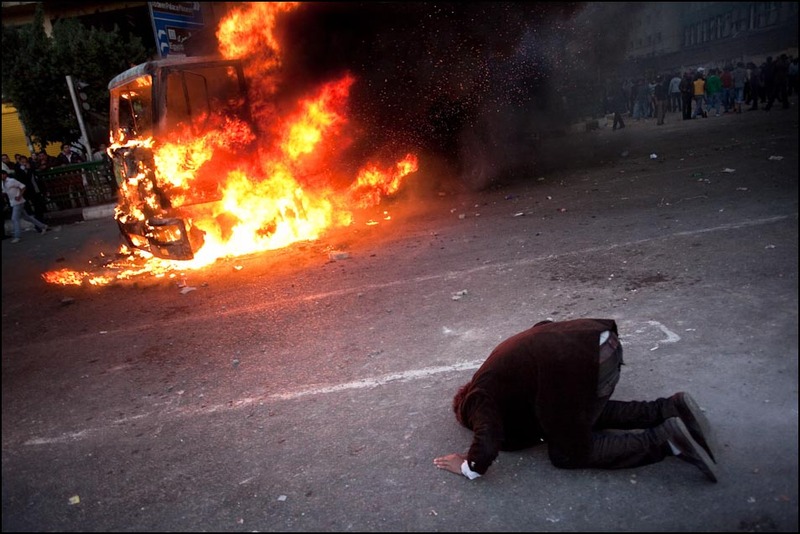 And I had more confidence to be at the very front lines with the guys with the petrol bombs and stones. My biggest worry was getting shot by the police -- and that did happen to me, twice, but fortunately not in the face or head. It was rubber bullets and bird shot, not live ammunition. It hurt like hell, got a little bruised and bloody, but I was able to work. I found a group of young, angry, and fearless stone throwers, and I stuck with them for a while. Things started to turn ugly when police snipers on the rooftops started shooting protesters. You have to work with a purpose in mind, you can't linger or hang out. That makes you a sitting target. How do people perceive/interact with you during moments like this? Most were too busy fighting the security forces, consisting of police and soldiers, to notice me. The mood would shift and sometimes older guys wanted to mess with me. As a light-skinned foreigner, I stand out. 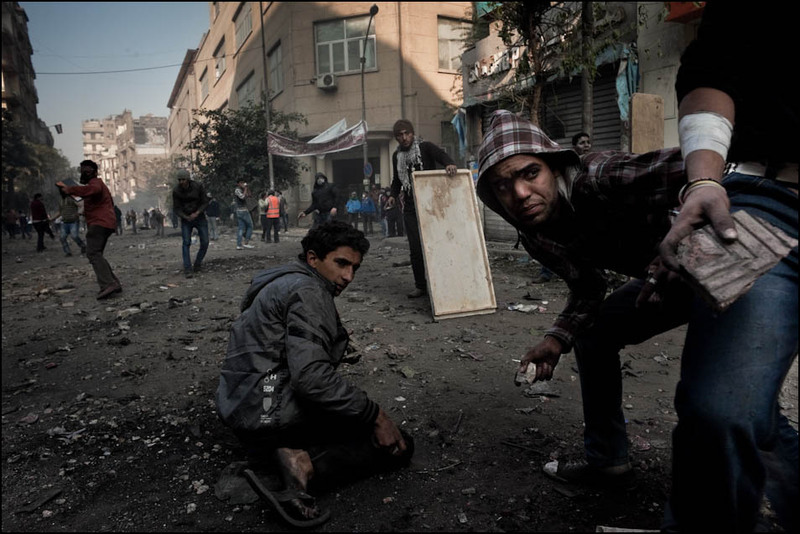 People in Cairo are paranoid, especially when they see a guy with a camera. But I move around a lot and try not to get cornered. I never had any real problems that I couldn't talk my way out of. I shouldn't have been surprised at how violent the police were, but still, it was kind of shocking. 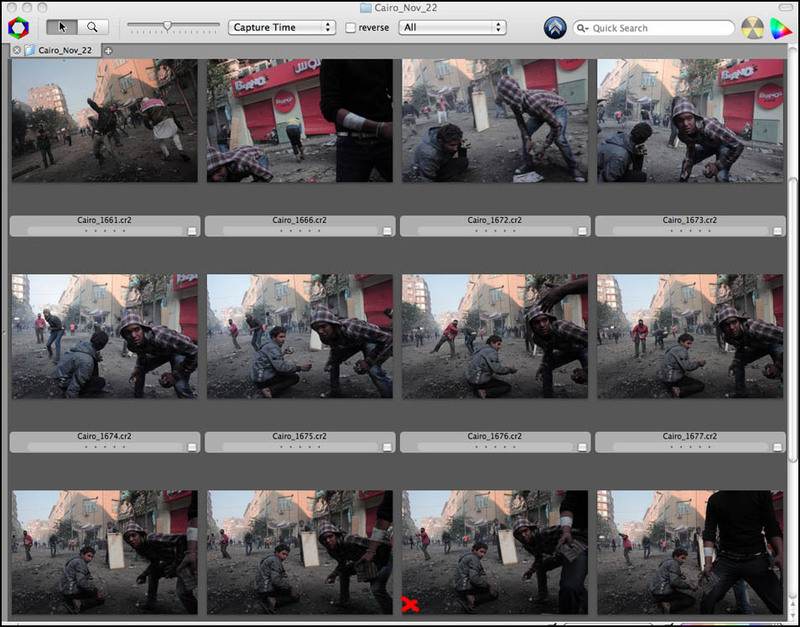 I nearly coughed a lung out -- I was surprised how much tear gas was used and how strong it was. What have you learned about yourself from the making of this type of images? Thanks so much. In conclusion, what advice do you have for photographers? Photojournalism is an intellectual, emotional and athletic profession. Read as much as possible, be playful in life, and stay in shape. Timothy Fadek is based between New York and Berlin. He began his career in photography at 28, after having worked in advertising. He is now represented by Laif in Germany and Luz Photo in Italy, having previously worked with Gamma (2000-2003) and Polaris (2003 - 2011). His key bodies of work to date have included conflict coverage in Iraq, Lebanon, Haiti, Macedonia, Israel and the Palestinian Territories, in addition to post-conflict coverage in Kosovo, the 9/11 attack on the World Trade Center, the 2010 earthquake in Haiti, presidential elections in Venezuela, Mexico and the United States, the aftermath of Hurricane Katrina, social issues such as the murders of women in Juarez, Mexico, the population explosion in Chongqing, China, foster care in New York, and most recently, the effects of the gold rush in Mongolia. 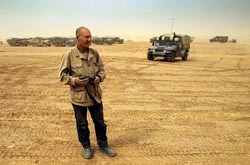 He has won several awards including Pictures of the Year (POYi), Best of Photojournalism (NPPA), Henri Nannen Preis (finalist), Communication Arts, and was named a Hero of Photography by American Photo magazine. 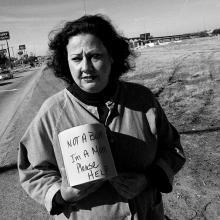 Fadek has spoken at many organizations and universities, including the International Center of Photography, New York University, and the Paley Center for Media and has served as an adjunct professor at Columbia University Graduate School of Journalism.